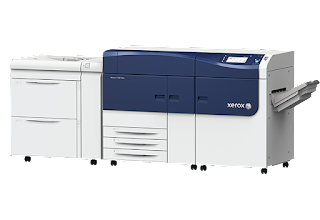 The Xerox® Versant™ 2100 is a revolutionary new product that gives you the amazing color control and automation tools found on the Xerox 800 and 1000 but with a modular design that allows a much smaller footprint. When you tap into this burgeoning demand for short runs, quick turnarounds and personalized print, and have the hundreds of jobs you need to print in a day to get a return on your investment, the sobering truth can settle in. Fifty to 100 or more jobs in a day simply can’t be produced using the same processes and equipment as in the past. The Xerox® Versant™ 2100 Press brings together automation from beginning to end to make it possible—and productive—to produce the greater number of smaller jobs that now characterize the print marketplace. Is it Xerox fine machine for office purposes and what about the Kyocera who's Cartridge Set Pack is easily available in market both compatible and branded?